We are always on the lookout for a place that serves proper Sunday roast – you will be surprised that such restaurants were few and far between. 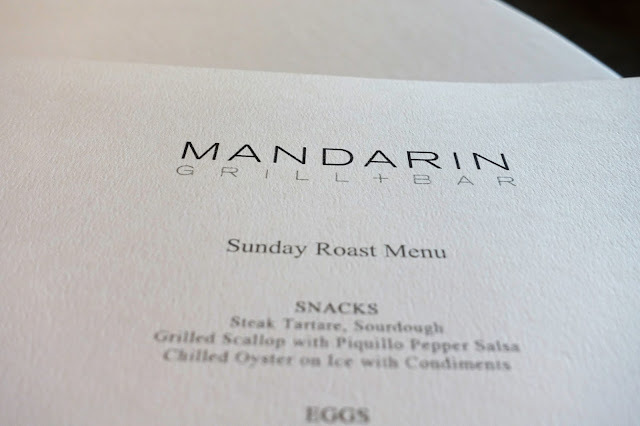 The latest one we tried was the Mandarin Grill, which offers the Sunday brunch set menu with a number of roast items available. It’s been a long while since our last visit to the restaurant but nothing much has changed with the same modern but formal style, with mostly round tables with leather couches, floor-to-ceiling window on one side looking over the neighboring Statue Square and the open kitchen counter on the other. 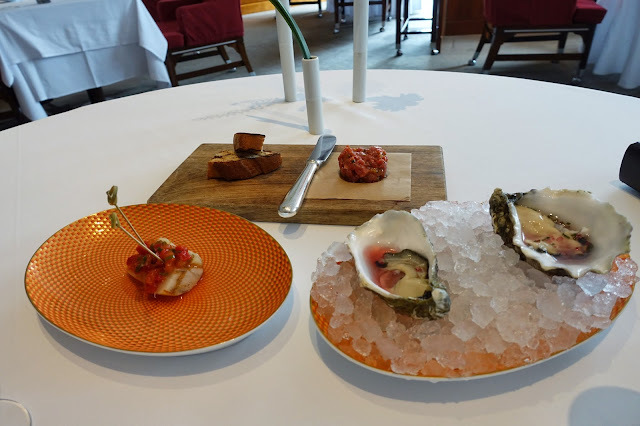 As we settled down over a glass of champagne (that was included as part of the brunch menu), we were served three bite-sized snacks as amuse-bouche. I thought the mini steak tartare with sourdough toast was lovely and the grilled halved scallop with piquillo pepper salsa and the Gillardeau oyster with mignonette were just as what we expected from a high-end restaurant (with a Michelin star to show forth). 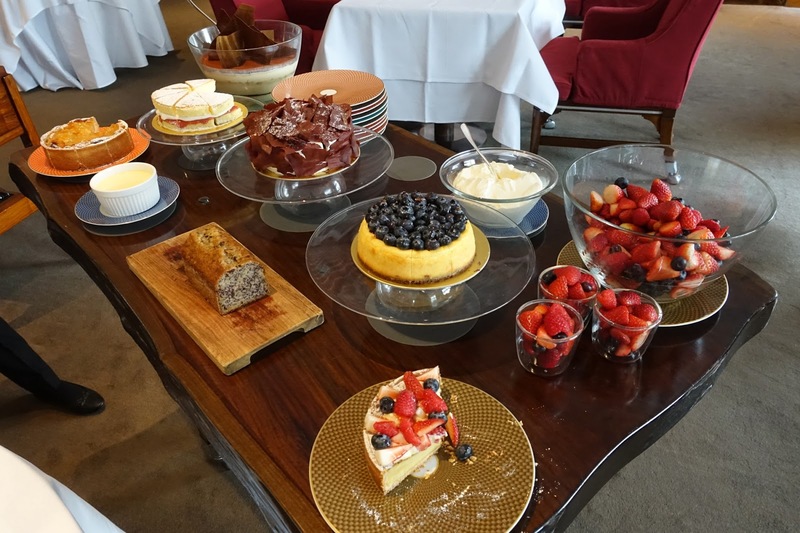 The rest of Sunday brunch menu consists of egg, appetizer, and main courses plus sides, then finished with items from the dessert trolley. 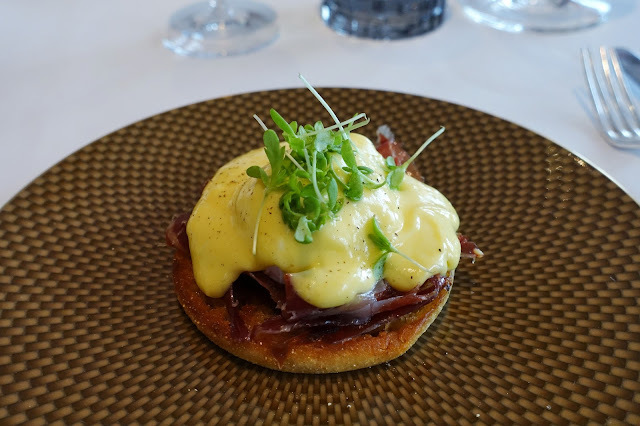 One could never go wrong with Eggs Benedict to start, with a well toasted English muffin and on top, poached egg with the oozy yolk, slices of jamon and truffle Hollandaise sauce. I count Mandarin Oriental as the place serving the best breakfast in town and this classic breakfast dish didn’t disappoint. All appetizer choices sound appealing – wish I could order more than one – and my housemade smoked salmon was spot on. Carted in in a silver trolley and carved by the table and served with the usual condiments (capers, chives, creme fraiche, egg yolks, and onions), the salmon slices got a mild smoky flavor with excellent texture, and the portion was generous too – big enough to share. The main course choice was a no-brainer. 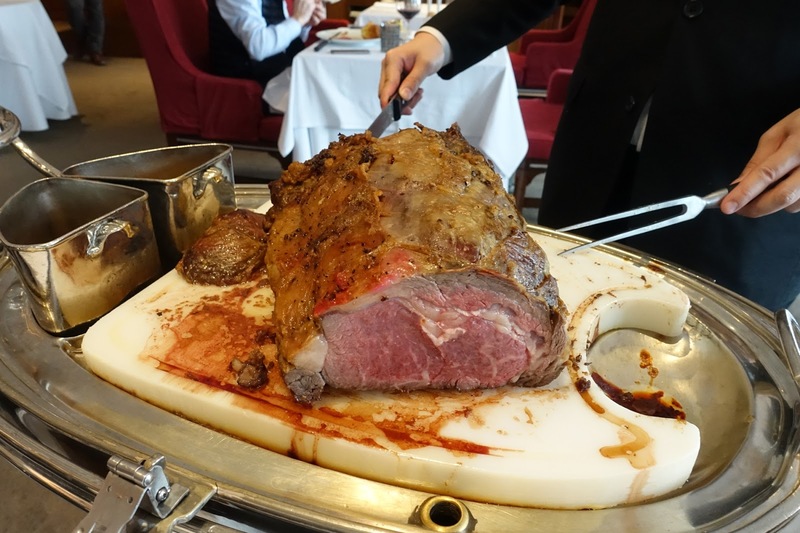 There were a few types of meat available (even with one vegetarian option) but of course, we were going for the classic roast. Again, the whole piece was brought to us on a trolley and carved in front of our table. I normally prefer my piece of prime rib done medium-rare and that’s exactly what I was getting, with a thick slice cut right from the middle part with a fair bit of fatty crust. The roast beef was served au jus with Yorkshire pudding – and I thought it was definitely one of the best we have tried in town. 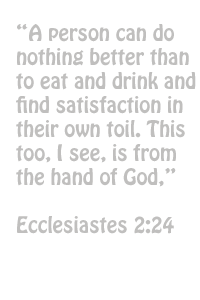 We also got to pick our sides – and their portions were big enough to share as well served in mini-casseroles. My favorite ones were the mac n cheese served with parmesan breadcrumbs, and the mixed roast vegetables (asparagus, leeks, carrots and parsnip). We got to pick the desserts at the end from the trolley, but luckily this time we didn’t have to stick with a single choice. There were a few that we both wanted to try, so ended up we asked for a platter to share between the two of us. The tiramisu was done the style I wanted, with a soggy layer of ladyfingers well soaked with liquor and soft mascarpone zabaglione. I also loved the apple tart with a well-baked pastry crust and the slice of soft banana cake. Hands down the best Sunday Roast in town.